What Are the Benefits of Rubber Compression Molding? Rubber compression molding is a tried and proven method of manufacturing simple parts and components made from a raw rubber material. An easy way to visualize this process is to think of how a waffle iron makes waffles. For compression molding products, a skilled operator places uncured material inside a mold cavity. That cavity then closes, heats, and once the material cures, it ejects from the mold in a product shaped and sized according to the customer’s specifications. Although not overly complicated, there are essential rubber compression molding process steps to follow. Missing even one of these could easily result in a defective product, costing both the customer and the manufacturing company money as well as precious time. A top manufacturer has skilled operators who use cutting-edge machinery and top-quality raw material to ensure every product made meets if not exceeds what the customer wants. There are benefits in following the right compression molding process steps beyond saving time and money. For one thing, based on the way compression molding equipment works, the cost of tooling is dramatically less compared with other processes. Due to quick mold changeover, this process reduces lead time. Not only is that a cost-effective benefit, but it also means top manufacturing companies that offer this process can accommodate tight deadlines and last-minute requests, all without compromising on the quality of the finished part or component. Although a lot of people rely on compression molding for simple products, this process is also ideal for prototyping. If you are still in the design phase or want a prototype made to ensure it meets all specifications, this method of molding is ideal. One more thing, compared to other processes, compression molding produces the broadest range of part sizes. The bottom line, if you need a prototype or short production run of a repeatable rubber part or component, compression molding offers tremendous benefits. When doing business with a reputable manufacturing company, you can expect a skilled operator to produce exactly what you want and when you need it. For this type of rubber product, you cannot afford even the smallest mistake. RPM Industries has years of experience with compression molding. We offer a fast turnaround on both prototypes and short production runs. 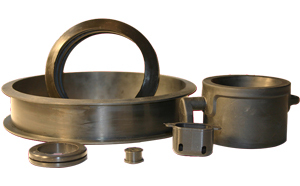 For a precision molded product, give us a call. A company representative will gladly answer your questions and provide information to put your mind at ease. Even for superior-quality, we keep our prices affordable. Our goal is to produce the best compression molded product possible and surpass your expectations.